I know that most of the people who are reading this newspost wouldn't want to listen to a Christmas song at this time of the year from all times, but regardless, I'm posting it anyway. It has vocals, took a lot of work, and it did well in some contests too! Came fourth in the MAC and second in the NAC, which is awesome. Check it out! Here's a screenshot of the project file, as per tradition. Also, I remixed the Journey soundtrack! Are you an audio artist? Yes? Then be sure to give the Christmas Monthly Audio Contest a shot. No? Then be sure to learn how to make music in a few weeks and give it a shot anyway. ...not quite Sparta just yet. 5 more fans till I reach 300. Please do check out this newspost, listen to one or more of the tracks over there and then consider following me. The 300th person to follow me may or may not receive a large shipment of chocolate-chip cookies. EDIT: 296 fans! Thanks funnybone1! EDIT 2: And that's 297! Thanks goes to LyingPink! EDIT 3: 298! You have my gratitude SockRape. EDIT 4: Wow, 299! That's four new fans in the space of 15 hours. One more left. Thank you MisterRazi! EDIT: 5: YAY 301 fans. It's funny though... when I was asleep dragontamer44722 and Megamannt92 favourited me, and I don't know who favourited me first, therefore I don't know who the 300th fan is and I am therefore unable to send any cookies to anyone! Ever heard of the Metroid remix album Harmony of a Hunter: 101% Run? If you haven't, then check it out; it's free and it's amazing. Anything which can be described with those two adjectives must be worth looking into, right? Anyway, I made four Metroid remixes for that album! Check them out! As much as I dislike Facebook, it's probably the most popular site on the Internet so I thought I should give it a try and see if it takes off. Here's a Facebook page for my music which I might update every now and again. If anyone wishes to Like it, then by all means, feel free to do so! ...and listen to this incredible piece of music by a friend of mine. Like what you hear? Of course you do. And he made a whole album full of music like that! Check it out on Amazon or iTunes! ...A NEW SONG BY STEP. 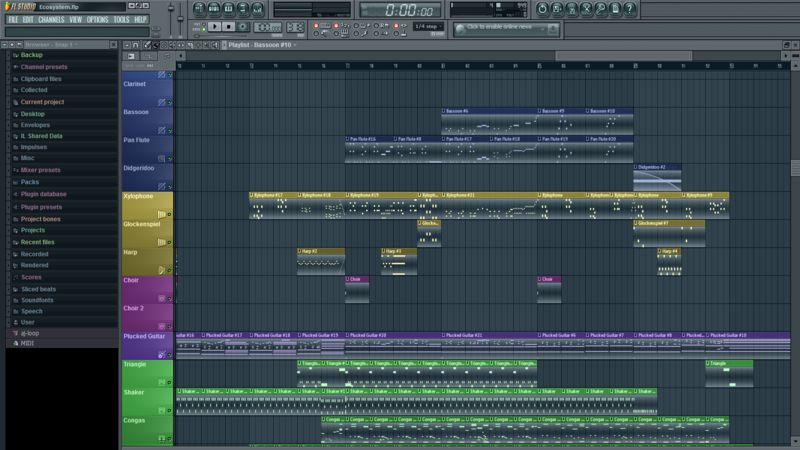 Complemented by an FL Studio project file screenshot and a link to the thread of the contest this submission is for. Please do give some feedback :3. Say hello to the newest addition to the family. Does your music sound good? Do you want it to sound even better? For free? WELL OF COURSE YOU DO. I made a new song at last. This one's for a school project so if you've happened to stumble upon my profile and you're the type to leave the page the instant you see these advertising newsposts, I would very highly appreciate you making an exception just this once :3. Here's a screenshot. The pattern indicator is no lie; this actually took 318 patterns. Don't ask me how.